Magellan Explorist 510 Tinjauan Para Ahli - Baca Tinjauan dan Beli Lebih Pintar secara Online. Keputusan: The Magellan eXplorist 510 is mid-performance GPS unit with all the bells and whistles. You can fully document your adventures using the built-in 3.2MP camera, video and voice recorder. This GPS and WAAS-enabled receiver provides decent reception to mark way points and follow tracks. Keputusan: The Magellan eXplorist GC sits at a price and feature sweet spot that makes it a great entry point into the world of geocaching for the urban outdoorsman. 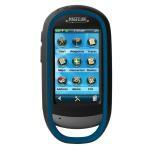 Keputusan: Magellan's eXplorist 510 is a handheld GPS device designed for outdoors enthusiasts. With a current price of about $325 it's for people who are looking for a few more advanced features, like expandable storage, and cool perks, like a built-in camera, but still want something that is easy to use. Keputusan: The Magellan eXplorist 510 is a mid-range model in Magellan's handheld line. Like the eXplorist 610 and 710, this model sports a bright 3.0" color touchscreen and 3.2 MP geotagging camera, along with a microphone and speaker for field notes. Pros: The eXplorist GC is a rugged little GPS device that is IPX-7 waterproof. The device is ready to go out of the box, with preloaded geocaches and included batteries. All relevant information about a geocache can be accessed from the eXplorist's well-organized menu. Keputusan: Very good unit, nice size touch screen makes it very easy to use. Keputusan: I'm still testing this product. I'm not using the Geo caching at all, I used this gps to navigate while riding my mountain bike in the woods. So far so good. Keputusan: I received the item from RSMSTUFF very quickly and it was very well wrapped. It was slightly cheaper than directly from Amazon. The first thing to notice was that it is solidly made and slightly heavier than I expected. Keputusan: I WAS VERY DISAPPOINTED THAT "BUNDLE" DIDN'T MEAN THE NAVIONICS MARINE SOFTWARE WAS INCLUDED IN THE PACKAGE. I WRITE THIS REVIEW SO OTHERS WON'T BE UPSET WITH THEIR PURCHASE. IF YOU WANT NAVIONICS YOU'LL HAVE TO BUY THE MAGELLAN EXPLORIST 510 "MARINE EDITION". ITS ABOUT $200.00 MORE THEN I PAID. Keputusan: Not recommended at all. I use GPS receivers for hiking and geocaching. What counts for me are accuracy, ruggedness, ease of use, and handling. While the eXplorist 510 shines in one, it completely fails in two categories. To sum this up: The Magellan eXplorist 510 is a great device in theory. Keputusan: I fully researched all of the Geocaching GPS receivers out there. You HAVE to subscribe to the Groundspeak website to use the paperless caching on ANY GPS. But you can enter coordinates manually for free. Also, you can get aerial imagery from Magellan for $30 a year. Neat Gadget for Outdoors Person, Rugged, Reliable, and Fun to Use. Keputusan: Overall, very neat portable GPS. Definitely stands up to some abuse. It is holding up nicely being attached to my mountain bike mostly when we go riding, has been rained on already, and dropped and it's tough as nails. Keputusan: Got it in and the first thing I did was test the gps... It jumped all over couldn't get signal hardly at all. And got no signal in the house or vein in my drive way.. Had to drive a lil ways in the car and then I had to stop on the side of the road and wate for 5min's to finally get signal.